Igor Levit’s recording of Beethoven’s late Piano Sonatas (see review) proved to be something of a revelation, opening a window of fresh air and sunlight onto music which at times can seem densely impenetrable. 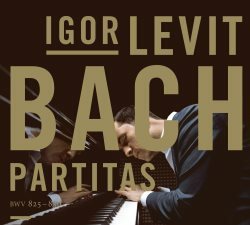 That was a brave debut, but Levit now leaps if anything into even more deeply competitive waters with a recording of Bach’s Six Partitas BWV 825-830. Comparing complete recordings on piano, there are too many for an entirely comprehensive list. Vladimir Feltsman on Nimbus (see review) is very fine indeed – certainly brisker in general than Levit but still with a highly attractive sense of individual personality and genuinely excellent recorded sound. Angela Hewitt on Hyperion (see review) is also a long-term favourite, and pretty close to Levit in terms of timings. Glenn Gould is and will always remain something of a law unto himself (see review), but in my view his Partitas are essential to any collection of Bach on the piano. I wasn’t expecting revelations when it came to Igor Levit’s Beethoven, and even having been through that experience I once again wasn’t expecting revelations with his Partitas. There are some pianists who are pretty high-impact with this music, and Roger Woodward (see review) and Martha Argerich (see review) both stamp a firm layer of individuality which goes beyond where Levit positions himself in terms of the ratio of Bach/performer. Levit is by no means self-effacing, but the feeling I take is that his choices are all pretty much in the service of the music and the composer. There are few if any extravagant flights or ornamentation, unconventional extremes of tempo or added pianistic effects such as octaves or much in the way of pedalling. The booklet notes, quite an extensive essay by Martin Geck called Partitas from a Shaman, only briefly touch on Levit’s view of these pieces but in a vital point. Levit’s quote includes the line, “… all the so-called Romantics (I invariably mean only the Germans) are far closer to Bach than to Mozart”. In this Levit draws a line backwards through Schumann and via Beethoven to Bach, which is a very fair point, but aren’t we as interpreters supposed to ignore what happens after a work is composed? Perhaps, but then we would still be arguing about piano versus harpsichord and I’m sure everyone has had quite enough of that by now. Mozart’s own well documented fascination with Bach appears to have become forgotten in this argument, but if we get too holistic then there wouldn’t be any point left to be made. Igor Levit avoids imposing Brahmsian romanticism onto his Bach, keeping his lines crisp, his rhythms stable and expressively elastic without introducing rubato as we might understand from a more romantic point of view. While taking each Partita and each movement on its own terms Levit performs that balancing act which makes a certain amount of rediscovery possible in this music. In seeking lines from Bach to the Romantics one has to ask the ‘why’: what might have been the elements in Bach which attracted Schumann? There is no need to emphasise particular points in the Partitas to heighten their pull for subsequent composers, and Levit doesn’t torture expressive elements or magnify certain progressions. His confiding lyricism is enough for our jaws to drop on behalf of any composer seeking to unveil the secrets of genuine expression in music. This is how we wish we could play these pieces ourselves, which is quite enough. Levit revels in the simplicity of something like the Allemande from the Partita No. 4, turning Bach’s abstract musical argument into a narrative which can speak to us on many levels. This is also true of the more sparkling and virtuoso movements, such as the Gigue from the same work. These are notes which talk. What more could one ask of a musician than this? Superbly recorded and performed as are so many, the question when reviewing a release such as this these days is less, ‘is this superior to’, and more, ‘can we persuade you to?’ If you don’t possess Bach’s keyboard Partitas then this is a wonderful collection to have at your disposal – more expressive than immediately exciting perhaps, but a recording to cherish on a long-term basis. The chance is perhaps greater that you already have some or all of these pieces in your collection, so why acquire more? Igor Levit has a way with Bach which brings the music to life, communicating to a greater extent than most. This is almost a hackneyed commentary – communicating what exactly? All performances communicate something, but if you find ones which draw you in and seem to speak a language both attractively familiar as well as infinitely intriguing and poetic then these are the ones onto which you will want to hold. This is what we are all looking for when clattering through the CD cases in a shop, or more likely these days when browsing the lists online. Like me you will probably have noticed that such finds are all too rare, but this one is like a gift from above.